Iran and Israel are in the news after recent skirmishes that even saw an Israeli jet downed. Israeli Prime Minister displayed part of a downed Iranian drone at an international conference as he addressed Iran's Foreign Minister saying "Do not test Israel's resolve." Threats and counter threats are going back and forth. The danger of an all-out war is increasing between Iran and Israel. News stories included below give evidence of the increased tensions. Note that I am simply sharing items of interest for your information. That does not imply that I agree with everything presented here or with other material that may be on a source's other web pages. Tel Aviv will be "leveled to the ground" if Israel attacks Iran, and Prime Minister Benjamin Netanyahu will not escape with his life, a senior official in the Islamic republic's regime threatened. 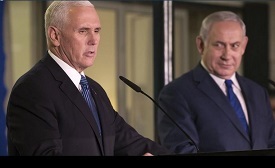 His comments came in response to Netanyahu's speech on Sunday at the Munich Security Conference, in which the prime minister brandished a piece of an Iranian drone downed in Israeli airspace and threatened direct military action against Iran. "About Netanyahu's unwise words, I should say that if they carry out the slightest unwise move against Iran, we will level Tel Aviv to the ground," Mohsen Rezaei, secretary of Iran's Expediency Council and former chief of the country's Revolutionary Guards, told the Hezbollah-affiliated Arabic-language al-Manar TV channel Monday. Adding a personal threat to the Israeli leader's life, Rezaei added that Tehran "will not give Netanyahu any opportunity to flee," Fars News reported. Netanyahu singled out Iran's Foreign Minister Mohammad Javad Zarif in his speech at the security conference, as he lifted up a piece of the drone's wreckage. "Mr. Zarif, do you recognize this? You should, it's yours. You can take back with you a message to the tyrants of Tehran - do not test Israel's resolve!" proclaimed Netanyahu to the audience, which included Zarif. Ray's note: In the situation between Iran and Israel, news from the choas in Syria may be the first indication of something gonig out of control and sparking a wider conflict. Tensions between Israel and Iran have hit a new high following last weekend's unprecedented military clashes inside Syria. The fighting has intensified fears that the Middle East is heading for all-out war. But such alarming predictions assume both protagonists standing toe-to-toe, actually want to fight. Is this really true? Iran is portrayed as a wanton aggressor, especially by the Trump administration and the Saudis. It has steadily expanded its military presence in Syria since supporting Bashar al-Assad after 2011, deploying Afghan and Pakistani Shia militias, Lebanese Hezbollah fighters and its own Revolutionary Guards. Its former president, Mahmoud Ahmadinejad, permanently upped the ante in 2005 when he allegedly called for Israel to be "wiped off the map". His exact words are disputed, but the sentiment behind them has not been convincingly repudiated by Tehran. Many Israelis remain convinced that Iran poses an existential threat. Emboldened by a belief that Assad is winning, Iran is turning its eyes, and guns, on Israel - or so Israeli leaders believe. Their "red lines" - forbidding a permanent Iranian military presence in Syria and the transfer of advanced weapons to Hezbollah - are being ignored. Israeli commanders are particularly exercised by Iran's construction of an underground factory in Lebanon that will, they say, provide Hezbollah with long-range, precision missiles. There was talk last week of taking the fight to Iran rather than waiting to be attacked. Iran unveiled a series of new homemade nuclear-capable ballistic missiles during military parades held over the weekend, a move that experts view as a bid to bolster the hardline ruling regime as dissidents continue efforts to stir protest. EDITOR'S NOTE: Iran, armed with an ever-increasing battery of missiles and a firm alliance with Russia, is doggedly pursuing a confrontation with Israel. The Iranian drone incursion that triggered a series of Syrian airstrikes over the weekend that resulted in the loss of an Israel f-16 is proof of that. The policies of the Obama administration allowed Iranian technology to advance to the point now where Israel has no choice but to prepare to attack. 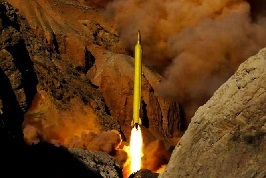 On the heels of an encounter between an Iranian drone and Israeli forces, Iranian leaders showcased their ballistic missile capabilities, which includes a nuclear-capable medium-range missile that appears to share similarities with North Korean technology, according to experts. The nuclear-capable missile can strike Israel even when fired from Iranian territory, raising concerns about an impending conflict between Tehran and the Jewish state that could further inflame the region. Iranian military leaders bragged the ballistic missile "can be launched from mobile platforms or silos in different positions and can escape missile defense shields due to their radar-evading capability," according to reports in Iran's state-controlled media. The latest technology could further inflame tensions between Israel and Iran, which funds and controls terror organizations operating along Israel's border. Concerns that this nuclear-capable technology could be shared by Iran with its terrorist proxies are fueling longstanding concerns among the Israelis that an attack is imminent. It's true that CNN and the New York Times, among other liberal outlets, have rightly been called out for their failure to report accurately on the protests in Iran. But there's something that not even the conservative media is telling you today, an important backstory that might be playing a role in this rising protest movement. As for the leftwing media, Caroline Glick noted in her article in the Jerusalem Post that, "Given the earth shattering potential of the protests it is extraordinary to see the liberal media in the US and Europe struggle to downplay their significance." And here in the US, "the US, former members of the Obama administration and the liberal media have determinedly downplayed the importance of the protests." Similarly, writing for the Daily Wire, Ryan Saavedra stated that, "The media initially ignored what was going on in Iran, likely because it reflected negatively on former President Barack Obama, whose Iran nuclear deal was supposed to help Iran's economy, and because the Trump administration's response was night-and-day better than Obama's response in 2009. "CNN and The New York Times did a terrible job of covering the protests, while ABC News' Matthew Dowd declared that the U.S. did not have the moral authority to talk about Iran because 'we' don't talk about Russia." So, again, the liberal media has been taken to task for its unfair coverage of the Iranian protests, and rightly so. In fact, it would be hard to find a greater contrast than that between the courageous protesters and the cowardly media. But there's something else going on in Iran that could well be playing an important role in the rising Iranian discontent. It's something that has been building and growing under the surface and behind closed doors. And it remains one of the best kept secrets in the world, despite occasional media reports in the last few years: Iranian Muslims are converting to Christianity at an unprecedented pace, perhaps by the thousands every day. Iran has just issued a chilling warning to the West. The nation has declared that it will not negotiate over its authority in the Middle East and its presence in other certain nations. Iran's comments come as French foreign minister sought to discuss Tehran's role in regional conflicts on a visit to the capital. Supreme Leader Ayatollah Ali Khamenei said that Iran will not negotiate with the West over its presence in the Middle East. Jean-Yves Le Drian, France's foreign minister, traveled to Tehran on Monday with a brief to reaffirm Europe's support for a nuclear deal that opened Iran's economy while echoing the United State's concern about Tehran's missile program and its influence in the region. French President Emmanuel Macron has criticised the program and raised the possibility of new sanctions. "European countries come (to Tehran) and say we want to negotiate with Iran over its presence in the region. It is none of your business. It is our region. Why are you here?" Khamenei was quoted as saying by his official website. Khamenei said Iran would only negotiate their presence in the region with other nation-states in the Middle East. According to the Express UK, President Donald Trump has threatened to pull out of the nuclear deal unless three European signatories help "fix" the accord by forcing Iran to limit its sway in the Middle East and rein in its missile program. Iran responded by saying "We will negotiate with America when we wanted to be present in America," he added. Trump has also promised that he would never allow Iran to become nuclear. The Trump administration will "never allow Iran to acquire a nuclear weapon" as it seeks to prevent the outbreak of World War 3 with Hassan Rouhani, Vice President Mike Pence has declared. Pence warned the move by Trump signaled Hassan Rouhani's final opportunity. "Make no mistake about it, this is their last chance. Unless the Iran nuclear deal is fixed in the coming months, the United States of America will withdraw from the Iran nuclear deal immediately. Former Head of IDF Intelligence: "Major Strategic Clash" With Iran "On the Horizon"
Israel and the Islamic Republic of Iran are on a collision course, a leading expert said on Sunday in the wake of Saturday's clash between the Jewish state and forces loyal to Iran in neighboring Syria. 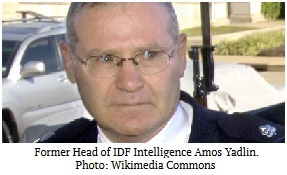 There is "a major strategic clash on the horizon," said Amos Yadlin, the former head of IDF Intelligence and Executive Director of the Institute for National Security Studies (INSS). Yadlin made his comments to the Hebrew-language daily Maariv the day after Israel shot down an Iranian drone over its territory and then retaliated with major airstrikes in Syria. 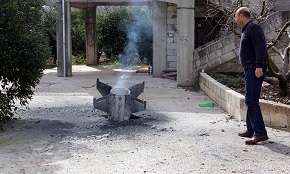 "We are speaking about an attempt that has never been made before," Yadlin said of the drone infiltration, and added that the likely motivation was Iran's desire to prevent Israel's ongoing attempts to prevent weapons transfers to the Hezbollah terrorist organization in Lebanon. "The Iranians are not satisfied with the freedom of action Israel has taken and thus wanted to show Israel that it is also capable of attacking [Israeli] territory," Yadlin commented. The Iranians hoped that Israel would not respond to the escalation, but were quickly proven wrong. "There is no other air force in the world capable of achieving a goal like this within two hours," Yadlin said of Israel's response. While the shooting down of the Israeli fighter jet was an accomplishment widely touted by Israel's enemies, the destruction of significant Syrian air defense systems appear to leave Syria and it's Iranian backers in a much weaker position to defend against future Israeli air raids. In the early hours Saturday morning, Israel and a Syrian-Iranian alliance became engaged in a confrontation that left an Israeli F-16 destroyed, in addition to the downing of an Iranian-made drone, and numerous military targets within Syria destroyed. While the shooting down of the Israeli fighter jet was an accomplishment widely touted by Israel's enemies, the destruction of significant Syrian air defense systems appear to leave Syria and it's Iranian backers in a much weaker position to defend against future Israeli air raids. Speaking to reporters on a conference call, IDF Spokesman Lt. Col. Jonathan Conricus provided a clear breakdown of the confrontation's events. An Iranian 'stealth' drone, modeled on the American RQ-170 drone, took off from the T4 airbase in central Syria, located deep in the Syrian desert near Palmyra. According to the IDF, this airbase has been taken over by the Iranian Quds Force-an elite overseas unit, used by Tehran to spread its dangerous influence across the Middle East. The Quds Force has been highly active in Syria, helping the regime of embattled Syrian President Bashar Assad to defeat rebel forces. Iran has been working to build missile factories in Syria, to produce weapons able to target Israeli cities. The Quds Force uses the T4 airbase to launch Iranian-made drones. Before sunrise on Saturday, Iran sent a drone south towards Syria's border with Jordan. From its launch, the Israeli Air Force (IAF) was monitoring the drone's flight path. IAF controllers watched as the drone entered Jordanian air space, and then tried to sneakily enter Israeli air space from Jordan-as opposed to from Syria-in an attempt to circumvent Israeli defenses. The drone flew for a minute and a half over Israel, before an IAF Apache combat helicopter shot it out of the sky at 4:25am. The IDF recovered the pieces and brought them back for analysis-providing an opportunity for Israel to study Iranian drone technology. Next, the IAF tracked the location of the Iranian caravan where a crew was controlling the drone, hundreds of kilometers away from Israel in the central Syrian desert. Just over an hour after the drone's interception, at 5:34am, eight Israeli jets took off on a mission to destroy the caravan, as well as additional Iranian military targets in Syria. Hovering over northern Israel, the jets fired long-range missiles, striking and destroying their targets. Ray's note: The spark that will likely ignite the present tensions between Arab countries and especially Iran towards Israel would be news regarding the status of Jerusalem and of the holy sites in particular. The following article addresses why the embassy question is so important. President Trump announced late last year that the U.S. will formally recognize Jerusalem as the capital of Israel - and it looks like the new U.S. embassy will be ready ahead of schedule. The U.S. embassy in Jerusalem will open in May in order to coincide with the 70th anniversary of Israel declaring its independence, the Trump administration said on Feb. 23. The Trump administration's decision to recognize Jerusalem as the capital was heralded by many pro-Israel activists but decried by Palestinians and America's Arab allies. Read on to find out why the decision is so contentious - and why it wasn't accomplished before. Palestinian Leader Abbas at UN Security Council: "Israel Occupied Our Territories in 1948"
headquarters in New York City, Feb. 20, 2018. Photo: Reuters / Lucas Jackson. Palestinian Authority President Mahmoud Abbas appeared to endorse the idea that all of Israel is illegally-occupied territory in a speech he delivered at a UN Security Council meeting in New York City on Tuesday. In a lengthy, rambling discourse given in a voice that sometimes was little more than a mumble, Abbas said, "No one has held Israel accountable when it occupied our territories in 1948." Extremist Palestinians and their supporters often refer to the "occupation" as including all of current Israel, thus rejecting the Jewish state's legitimacy and right to exist. Abbas also embraced another extremist Palestinian myth, making the claim, "We are the descendants of the Canaanites that lived in Palestine 5,000 years ago." He also clearly rejected any Jewish national rights in the Land of Israel, saying that in the Balfour Declaration, in which Britain endorsed the creation of a Jewish "national home" in then-Palestine, "those who did not own gave to those who had no right." In addition, Abbas decried "Israel's refusal to implement Resolution 181," thus endorsing the "right of return" that would flood Israel with millions of Palestinian refugees. In a long peroration, Abbas claimed that the Palestinians had "persisted in our efforts to reach peace. ... It was the Israeli government's intransigence that caused the failure of all of this." The Palestinians opposed a partition plan that would have created a two-state solution in 1947, rejected a proposed peace agreement in 2000, and did so several more times over the subsequent decade. Abbas also denied that the Palestinians engage in terrorism and incitement to violence, saying his people are "committed to fostering a culture of peace and rejection of violence," and their goal "is one thing only: fighting terrorism." As expected, Abbas also slammed the Trump administration for its decision to recognize Jerusalem as Israel's capital, calling it a "dangerous and unprecedented" move. The US, he said, chose to "remove Jerusalem from the table. ... It did so ignoring that east Jerusalem is a part of the Palestinian territory." While mystery still surrounds the statement by now-former Secretary of State Rex Tillerson who on Monday - when he already knew he was fired - said that Moscow is "clearly" behind the poisoning of Russian double-agent Skripal in the UK and that the Russian action would "trigger a response", and whether this was a tacit defiance of Trump as he no longer had anything to lose, it is clear that relations between Russia and the US, if not so much Trump, are once again at rock bottom, if not worse. Confirming this, one week after the WaPo reported that the US is considering new military action against Syria over Assad's alleged chemical weapons attacks (as on every other prior occasion), the Russian military threatened action against the U.S. if it strikes Syria's capital city of Damascus. 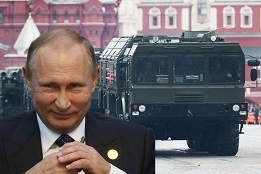 The threat, by Chief of Russia's General Staff Valery Gerasimov, was reported by Russia media sites such as state news agencies RIA and Tass, according to CNBC. The General also said Russia had "reliable information" about militants preparing to falsify a government chemical attack against civilians. In other words, another US-false flag attack, like the one launched in 2013 which nearly caused military conflict between Russia and the US. Gerasimov predicted that the U.S. would then use this attack to accuse Syrian government troops of using chemical weapons. He added that the U.S. would then plan to launch a missile strike on government districts in Damascus. But far more ominously, Gerasimov said Russia would respond to a U.S. strike on Syria if the lives of Russian servicemen were threatened, targeting any missiles and launchers involved: "In case there is a threat to the lives of our military, the Russian Armed Force will take retaliatory measures both over the missiles and carriers that will use them," the Russian General said. By far the greater part of President Putin's State of the Nation address on 1st March 2018 was devoted to economic issues. However inevitably it was the part of his address which touched on new weapons systems which attracted the most attention. This is the best known of the new strategic nuclear weapons systems that President Putin touched on in his State of the Nation address. In fact we have discussed it previously. Here is what President Putin had to say about it. Voevoda's range is 11,000 km while Sarmat has practically no range restrictions. Donald Trump is a modern American man, one of the most powerful people in the world, thrice married and not known for his meekness. The heroine of the Purim story, Esther, was an orphaned Jewess from ancient Persia plucked out of obscurity to be queen, remembered for her courage to speak truth to power. Hardly anyone could think the two are alike in any way - except Paula White, Trump's favorite pastor, and her fellow evangelicals. In August of last year, a week after the riots in Charlottesville, Virginia, White compared Trump to Esther on "The Jim Bakker Show," a popular weekday evangelical broadcast. Trump, she said, was "raised up by God," and God was "raising up Esthers ... for such a time as this." Jews read the Book of Esther every year during the festival of Purim, which began Wednesday evening. It's a relatively minor holiday, but the story has an outsize significance for evangelicals, and White in particular. White sees it as proof that God can reward you while you're still on earth. Other pastors mine it for the potent, prophetic language that reflects evangelicals' sense of mission. 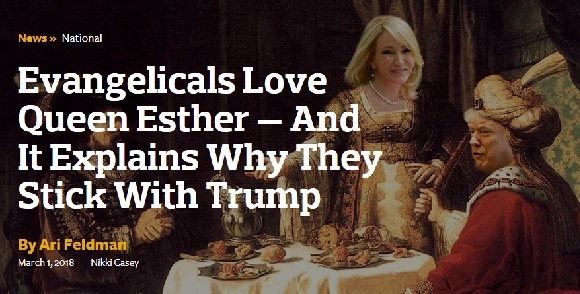 And their love of Esther - a highly sexualized character who lived in a world of obvious sinfulness - can even help provide an answer as to why they overwhelmingly came to support Trump. She is a flawed heroine who fulfills a holy destiny; they believe he will do the same. "Esther is this great example of [evangelicals] overlooking the obvious moral failings to the point where they don't even register," said Samuel Perry, a professor of sociology at the University of Oklahoma who studies Protestant Christianity. "She's fighting for Israel, so you just claim her as this noble character, just as evangelicals have done with Trump." Ray's note: The situation with Iran and Israel is not good news. 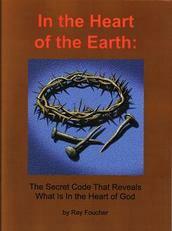 However, it is not the only thing going on in the world. There continue to be environmental problems and signs that normal is not normal any more. Another dormant volcano has suddenly awakened erupting in a rather spectacular fashion, spewing lava for the first time in known history. It sent an ash cloud 2.1 kilometers into the sky. 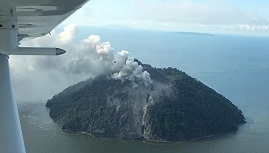 This ancient volcano on Kadovar Island, which is northeast of Papua New Guinea, has been dormant throughout human history until January 5th, 2018. It began to erupt at around noon, local time. The volcanic island is about 24 kilometers from the northern coast of mainland Papua New Guinea. Our model is also showing that there will be a rise in volcanic activity as we move into 2024. We previously warned: "If we see a series of volcanic eruptions in the VEI 6 category or greater within 2018, expect to see a very sharp turn down in temperature and Global Cooling will take on rapid change going into 2024." It is truly fascinating how this correlates to the change in the energy output of the sun. I am waiting for the Global Warming crowd to come up with a new theory that then blames humans for also increasing volcanic activity. Can't wait for that theory explanation. Last year, the snow appeared in Spain wiping out the crops and causing rationing of vegetables. 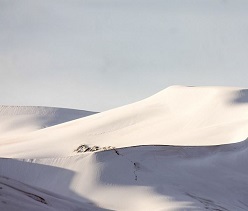 This year the snow went down even further and crossed into Algeria covering the desert. So while the Global Warming people are desperate to explain weather as caused by humans, we are ignoring the cycle of the sun which has caused ice ages and warming periods long before 1850. As the Dail Mail has reported, that up to 16 inches of snow has fallen on the Sahara desert. This is the third time in 37 years (8.6 x 4.3) that Algeria has even seen snow cover the desert. This is perfectly aligned with the 8.6-year cycle for the region.